Attributes: Casein Free, Dairy Free, Natural or Organic IngredientsIngredients: Chicken*, water, corn starch, salt, extract of oregano. Battered and breaded with: rice flour, tapioca dextrin, corn starch, salt, spices and spice extractives including extractive of paprika and extractive of tur.. 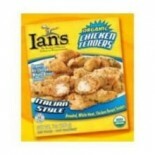 Attributes: Natural or Organic IngredientsIngredients: Organic chicken, water, organic rice starch, sea salt, natural flavor. Breaded with: organic wheat flour, organic evaporated cane juice, sea salt, torula yeast, organic soybean oil, organic paprika. Battered with: water, organic wheat flour, sea.. Attributes: Natural or Organic IngredientsIngredients: Organic Farm-Raised White Shrimp.Nutritions: Calcium(6), Calories(120), Cholesterol(115), Dietaryfiber(0), Fromfat(20), Iron(15), Protein(23), Saturatedfat(0), Servingscontainer(2), Servingsize(4 oz (113g)), Sodium(170), Sugars(0), Totalcarbs(1).. 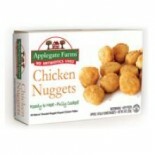 Attributes: Dairy Free, Natural or Organic Ingredients, Non-GMO Project Verified.. 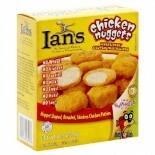 Attributes: Dairy Free, Egg Free, Gluten Free, Natural or Organic Ingredients, Wheat FreeIngredients: Chicken Nuggets (Skinless, boneless, no added antibiotic or hormone chicken breast with rib meat, canola oil, potato flakes, water, sea salt), coated with batter (water, yellow corn flour, corn star.. Attributes: Gluten Free, Natural or Organic Ingredients, Wheat FreeIngredients: Skinless, Boneless, Antibiotic and Hormone Free Chicken Breast with Rib Meat or Chicken Tenders, Batter (Water, Corn Flour, Corn Starch, Ground Italian Seasoning, Garlic Powder, Salt, Baking Powder), Cornflake Crumbs (..